We’d love your help. Let us know what’s wrong with this preview of Blizzard of Glass by Sally M. Walker. On December 6, 1917 two ships collided in Halifax Harbour. One ship was loaded top to bottom with munitions and one held relief supplies, both intended for wartorn Europe. The resulting blast flattened two towns, Halifax and Dartmouth, and killed nearly 2,000 people. As if that wasn't devastating enough, a blizzard hit the next day, dumping more than a foot of snow on the On December 6, 1917 two ships collided in Halifax Harbour. One ship was loaded top to bottom with munitions and one held relief supplies, both intended for wartorn Europe. The resulting blast flattened two towns, Halifax and Dartmouth, and killed nearly 2,000 people. As if that wasn't devastating enough, a blizzard hit the next day, dumping more than a foot of snow on the area and paralyzing much-needed relief efforts. To ask other readers questions about Blizzard of Glass, please sign up. Growing up in Chicago, I constantly heard and read about the Great Chicago Fire. However, I had never once heard about the Halifax Explosion of 1917. I wonder if that is simply a regional thing. The Halifax explosion is a very interesting story and I am surprised that it is not more well known (and I now wonder the same about the Chicago Fire elsewhere). Walker, however, took a nonfiction write by numbers approach to the book. She certainly presented some interesting details about the explosion, Growing up in Chicago, I constantly heard and read about the Great Chicago Fire. However, I had never once heard about the Halifax Explosion of 1917. I wonder if that is simply a regional thing. The Halifax explosion is a very interesting story and I am surprised that it is not more well known (and I now wonder the same about the Chicago Fire elsewhere). The Coles notes version of the Halifax explosion. Far from enough to grip and compel. Great book! It's the kind of non-fiction I like best, with a combination of facts and personal narrative, all told with a sweeping movement and intensity. The introductory chapters, where we hear about who went to work and who went to school and who stayed home sick and who only went to school in the afternoon, were unbearable as I waited to find out which of these places was safe and which wasn't. As is right and proper in juvenile non-fiction, much of the book focuses on children's experiences Great book! It's the kind of non-fiction I like best, with a combination of facts and personal narrative, all told with a sweeping movement and intensity. The introductory chapters, where we hear about who went to work and who went to school and who stayed home sick and who only went to school in the afternoon, were unbearable as I waited to find out which of these places was safe and which wasn't. As is right and proper in juvenile non-fiction, much of the book focuses on children's experiences and memories. The events of this book may have little bearing on the world today, as astonishing and horrific as it was at the time, but it is moving and fascinating all the same. I do notice that the last chapter of any juvenile narrative non-fiction seems to be the weak point, as the author tries to tie in the events of the book with the present day and/or make connections for the American child-reader. But this seems to be the expected way one ends such a book these days. Perhaps it's time for some creativity from authors and editors there. On Dec 6, 1917, there was an explosion in the Halifax Harbour. Around 2000 people were killed and many more injured. This book is aimed toward younger readers, but I found it a good introduction. There are also plenty of archival photos included. The author decided to tell the stories of a few specific families – to follow what happened to the people in those families, what they were doing at the time, etc. I do think this makes the book more “relatable”. I did know of the explosion, but this is On Dec 6, 1917, there was an explosion in the Halifax Harbour. Around 2000 people were killed and many more injured. I picked up an Advance Reader’s Edition of this book at the annual conference of the American Library Association last month. Technically, I am too biased to review it: Sally Walker is a friend and Henry Holt is publishing my own next book. But I’m not the sort of girl that would let those things sway her into praising a book she didn’t love ... and I love this book too much not to sing about it. In 1917, a ship carrying munitions into Halifax Harbor collided with another ship, setting off what w I picked up an Advance Reader’s Edition of this book at the annual conference of the American Library Association last month. Technically, I am too biased to review it: Sally Walker is a friend and Henry Holt is publishing my own next book. But I’m not the sort of girl that would let those things sway her into praising a book she didn’t love ... and I love this book too much not to sing about it. In 1917, a ship carrying munitions into Halifax Harbor collided with another ship, setting off what was then the largest man-made explosion in history. The accident happened on an otherwise humdrum December morning, and Sally Walker tells the story perfectly, bringing readers into Halifax, showing them around, feeding them breakfast, walking them to school, and leading them, moment by painstaking moment, toward the disaster that changed the community forever. She gives special attention to those facets of the story that will most intrigue young people, and she does so with respect and care for both her subjects and her readers. This is narrative nonfiction at its finest, folks. A page-turner right out of the history books, a disaster story told not for its shock value, but for its enduring value. Today’s kids are surrounded by disaster—natural or manmade, real or in sound-byte. To some of them, it may feel as if disaster is a new thing, as if dealing with it is something humans are not equipped for. The fact is—and BLIZZARD OF GLASS readers come to understand this—we humans have dealt with disaster for our entire history. And time and again, we’ve come together, in community, to help one another through. That message rings powerfully in this book, and its why I made sure both my tweens had a chance to read it before I passed it along, with rave reviews, to my town librarian. There was an explosion in 1917 that killed about 2,000 people in Halifax, Canada. Did you know about that? I sure didn't. But wow, what a story. There were two boats that crashed. But even worse is that one of the boats was totally loaded with TNT and other such things to help with the war in Europe. The result was the biggest explosion until the atomic bomb. The interesting thing about how Sally Walker tells the story is that she doesn't just tell facts about what happened. She tells the story There was an explosion in 1917 that killed about 2,000 people in Halifax, Canada. Did you know about that? I sure didn't. But wow, what a story. There were two boats that crashed. But even worse is that one of the boats was totally loaded with TNT and other such things to help with the war in Europe. The result was the biggest explosion until the atomic bomb. The interesting thing about how Sally Walker tells the story is that she doesn't just tell facts about what happened. She tells the story about various people and what they were doing. I kept reading about these school kids, these wives, or these telegraph workers or firemen thinking... "No, please don't be one of the ones that dies! I know you want to put the fire out, but it's going to explode before you get the first bucket of water on it!" Heart wrenching. This story made me wonder about serious devastation. I seem to be having a problem with books I am listening to on Overdrive. This is at least the second or third youth oriented book I have read. It is a well written one, but, still a children's book. I am very glad that this was not the first book I have read about the disaster that occurred in December 1917 in Halifax Harbor. Curse Of The Narrows by Laura M. MacDonald is ever so much better. This book, however, tones down the disaster that occurred whereas Curse brings home just how much of a di I seem to be having a problem with books I am listening to on Overdrive. This is at least the second or third youth oriented book I have read. It is a well written one, but, still a children's book. I am very glad that this was not the first book I have read about the disaster that occurred in December 1917 in Halifax Harbor. Curse Of The Narrows by Laura M. MacDonald is ever so much better. This book, however, tones down the disaster that occurred whereas Curse brings home just how much of a disaster it is. This is especially so because this isn't a very well known incident. Part of this was due to it occurring during WWI and Canada probably wanted to tone it down while many Canadians were blaming it on the Germans. Germany had nothing to do with it. Two ships collided in the middle of Halifax harbor. One of these ships was loaded with armaments and flammable stuff (coal, oil, etc) while the other was loaded with items meant for the saving of Belgium, including bandages and other related items that would catch fire real easy. At least one of the ships was abandoned and subsequently went plowing into the pier. The wreckage caused a tsunami. And a few days later they get a blizzard. So they had a confluence of fire, water (too much) and snow. Relief was unable to get through for several days. I knew nothing of the Halifax Explosion that was the largest man-made explosion until the atomic bombs dropped. The subject matter was fascinating but I think Walker could have done a better job in crafting the story. The photographs were great including illustrations but the addition of all of the different families (their jobs, their home life, who was sick, who was walking to school) left it too mundane to really want to muddle through. I wanted THE STORY. I wanted the thoughts, actions, what I knew nothing of the Halifax Explosion that was the largest man-made explosion until the atomic bombs dropped. The subject matter was fascinating but I think Walker could have done a better job in crafting the story. The photographs were great including illustrations but the addition of all of the different families (their jobs, their home life, who was sick, who was walking to school) left it too mundane to really want to muddle through. I wanted THE STORY. I wanted the thoughts, actions, what an explosion of that caliber does to things and really just a report how people were affected including deaths and injuries. The story was comprehensive, giving a feel for the area and its history and even what it's like now and what's studied in the history books, but the additional "human" touch didn't add anything to the story. What happened was story enough. Blizzard of Glass by Sally M. Walker is a nonfiction story that is a very gory book but it was worth the time.If you're into nonfiction I recommend it. Also if you're in 8th grade this book would be appropriate for you to read. I learned about a huge explosion that killed thousands and how the explosion happened; along the way, I learned about families how some survived and some didn't. I also learned about the wars they helped fight like World War 1. The reader doesn’t just learn about the explosion; we learn about how the Halifax boat carried supplies to wars and the recovery of the explosion and what else the explosion did. 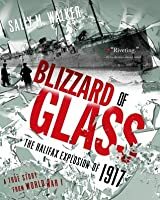 As if the explosion wasn't enough, there was a blizzard while they were trying to recover the dead and heal the living in Richmond and Halifax in 1917. This is a story I actually hadn't heard about before discovering this book, how is that possible? I liked the simple style of this book, where the author also adds an explanation to some of the terms used, some more useful than others. It was short enough to not feel dragged out, while still building up the story and also going into the aftermath and summarizing nicely. The audio book is 2 hours and 51 minutes, easily digested in an afternoon. A shorter version of a story I just learned about in the last year. Devastating and tragic, but with some hope and love intermingled. Awesome, freaky and terrifying -- and how had I never heard of the Halifax Explosion, the biggest man-made explosion before Hiroshima? These Canadians are really too quiet and unassuming. The book is super-suspenseful as the author ticks off what each member of several families living near the harbor was doing on the morning that two ships -- one laden with munitions -- converged. The tick-tick-tick tone of it all is sickeningly scary, super-cinematic, kind of puke-inducing. You have no idea as Awesome, freaky and terrifying -- and how had I never heard of the Halifax Explosion, the biggest man-made explosion before Hiroshima? These Canadians are really too quiet and unassuming. Umh, I think I might be crazy because all I've heard about this book is how amazing it is and how no one can put it down. I read it hoping to find some nonfiction books for our 7th and 8th grade teachers for next year. It was a really interesting topic. And some of the information in it was fascinating. I definetly want to know more about this moment in history. But, the author's voice was irritating and condescending. It's very difficult to write ya nonfiction well, and I don't think this is a g Umh, I think I might be crazy because all I've heard about this book is how amazing it is and how no one can put it down. I read it hoping to find some nonfiction books for our 7th and 8th grade teachers for next year. It was a really interesting topic. And some of the information in it was fascinating. I definetly want to know more about this moment in history. But, the author's voice was irritating and condescending. It's very difficult to write ya nonfiction well, and I don't think this is a good example of engaging writing for teens. Maybe I'm just really particular. I don't know. I will bring it to my middle school teachers to look at, but I'm not going to give it a very strong recommendation. I had never heard of this disaster that happened in Dec. 1917 in Halifax, Nova Scotia. This is a short children's nonfiction book, and I saw the title on an ALA's Best of.... booklist. A ship filled with munitions for World War I ran into another ship in Halifax Harbor. The resulting explosion was the largest manmade explosion that had ever occurred. It remained the largest manmade explosion until 1945 when the atom bomb was dropped on Hiroshima. Middle grade history, which means that it's accessibly written and full of personal narratives, possibly more so than an adult book on the same subject might be. And more pictures, too. The subject itself is fascinating enough on its own, and Walker builds up suspense by taking her time in setting the scene. She also doesn't skip out shortly after the explosion happened, instead following up on the relief efforts afterwards. Of course, you could always read the Wikipedia article on the explosion, Middle grade history, which means that it's accessibly written and full of personal narratives, possibly more so than an adult book on the same subject might be. And more pictures, too. The subject itself is fascinating enough on its own, and Walker builds up suspense by taking her time in setting the scene. She also doesn't skip out shortly after the explosion happened, instead following up on the relief efforts afterwards. December 6,1917 on that date can mean anything to anyone. Someone's birthday,wedding,or anything else. But on that date. There was a explosion.....that caused the next few days of the people in Nova Scotica to be miserable.this story is historical fiction. The explosion starts off with the ships.and one of them was carrying explosives for the war. And it crashes into another ship then black oil and a tsunami occurs. Then the next day there was a blizzard. A fascinating chronicle of the catastrophe and its human toll. A tale of heroism, courage, and love. Blizzard Of Glass is a decently short, nonfiction book written by Sally M. Walker. It is the story of one major event in history so it is not part of a series. The book is honestly geared toward children of all ages, but it is the themes I would say that make it a better read for tweens and teens. The book revolves around five young, joyous families, and how their everyday lives screech to a halt on that one faithful day. The Imo, a U.S. ship was leaving Ha A tale of heroism, courage, and love. The book revolves around five young, joyous families, and how their everyday lives screech to a halt on that one faithful day. The Imo, a U.S. ship was leaving Halifax harbour carrying highly anticipated medical supplies for the war raging in Europe. On the other side, the Mont-Blanc was carrying loads upon loads of munitions waiting to enter the harbor. These two ships were steaming towards disaster. What resulted was the deaths of almost two thousand people and the worst man-made explosion in mankind until the atomic bomb. At the heart of this wonderful book lies courage, bravery, and hope. Young boys are brave enough to go to travel far away, search for their families, and deal with loss without anyone there to lean on. Young girls must become nurses and medics and save thousands of the injured. Sadly, some children would end up never even seeing their parents, even if they had survived, due to the technology and confusion of that place and time. I believe that the purpose in writing this novel was for the author to get this important story out to the world. A story that was long forgotten in the shadows of wars. The author wanted the message of love and honor to get to these readers, and she amazingly succeeded. I was moved by this book and it’s timeless message that I had conjured up, stating, You don’t have to be strong to be brave. Courage lies in the smallest of people in the darkest times of history. I believe that the stories of these five families, and how the intertwined together made this book worthwhile. Most non-fiction books just tell the broader story, but Walker decided these families were the subjects and importance of the book. The broader story mattered, but that story could not be anything without these characters. I became interested in learning more about the Halifax explosion due to its 100th anniversary being acknowledged during discussion of Halifax's annual gift to Massachusetts of the Christmas tree that towers over Boston Common. When I added this book to my wish list, I didn't realise it was written for middle school readers, but that was serendipitous--a quick read, very informative, with true stories of families of Halifax and Dartmouth that lent a personal narrative to the factual reporting of I became interested in learning more about the Halifax explosion due to its 100th anniversary being acknowledged during discussion of Halifax's annual gift to Massachusetts of the Christmas tree that towers over Boston Common. When I added this book to my wish list, I didn't realise it was written for middle school readers, but that was serendipitous--a quick read, very informative, with true stories of families of Halifax and Dartmouth that lent a personal narrative to the factual reporting of the events. Imagine you’re about to take a business trip, and you’re frantically searching for an audiobook or two. 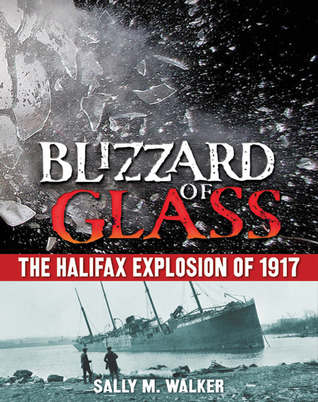 A few minutes of shelf reading later and Blizzard of Glass about the Halifax Explosion of 1917 is checked out and loaded in Libby. Not too far in though, I discover this book appears marketed to a Young Adult audience and likely as a school reading supplement. An awkward moment later, I’m back to enjoying the quick, dramatic telling of this tragic accident. Two ships meet at dawn in Halifax ha Imagine you’re about to take a business trip, and you’re frantically searching for an audiobook or two. 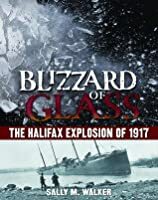 A few minutes of shelf reading later and Blizzard of Glass about the Halifax Explosion of 1917 is checked out and loaded in Libby. Not too far in though, I discover this book appears marketed to a Young Adult audience and likely as a school reading supplement. An awkward moment later, I’m back to enjoying the quick, dramatic telling of this tragic accident. Two ships meet at dawn in Halifax harbor and can’t quite pass in the morning; seconds later, 2,000 people are dead and huge swaths of two towns are all but leveled. The author packs a good bit of before and after backstory so you have some investment beyond the headline I shared above, and this was oh so readable, er, hearable. In fact, I think it was probably a better audiobook for this Old Adult reader.